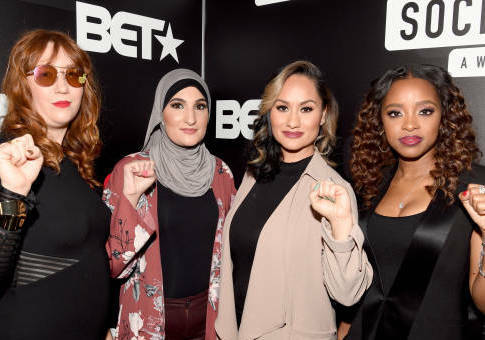 The founder of the Women's March called on its current leaders to step down for permitting racist rhetoric and anti-Semitism to infiltrate the movement. Teresa Shook accused several leaders of having "steered the Movement away from its true course." In response to Shook's statement, the four women "dismissed Shook’s contribution to the movement as at the ‘very beginning' and said she ‘irresponsibly' weighed in ‘to take advantage of our growing pains to try and fracture our network,'" the Daily Beast reports. "Our ongoing work speaks for itself," they wrote. "That’s our focus, not armchair critiques from those who want to take credit for our labor." Earlier this year, Mallory attended Nation of Islam leader Louis Farrakhan's annual Saviours' Day address, during which he attacked "that Satanic Jew," called Jews "the mother and father of apartheid," and declared that "when you want something in this world, the Jew holds the door." In 2016, she posted an image of Farrakhan on stage before an event at which he was speaking and wrote, "I'm super ready for this message!" She has also called the founding of Israel a "human rights crime." Last month, Farrakhan compared Jews to termites. Speaking at a Nation of Islam event in 2015, Sarsour downplayed anti-Semitism, denying that anti-Semitism is "systemic." She has also called for "jihad" against the Trump administration. She has said she felt "hurt" when the United States captured Saddam Hussein. In 2015, Perez posted a photo of her and Mallory holding hands with Farrakhan at an event in Chicago, describing the evening as "unforgettable." A New York Times opinion piece about the Women's March leaders noted Perez expressed admiration for Baba Sekou Odinga, a Black Panther convicted of trying to kill six police officers. This entry was posted in Politics and tagged Anti-Semitism, Israel, Linda Sarsour, Louis Farrakhan, Racism, Women's March. Bookmark the permalink.